The finalists for the Prometheus Awards, representing works that depict libertarian ideals, have been announced. This list from Black Girl Nerds is a few months old (from January) but it’s a great reading list. Speaking of reading lists, check our New Releases page for works coming out in May. Tor.com reviews Ray Bradbury’s The Martian Chronicles. 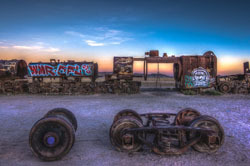 Trains from a locomotive graveyard in the Andean desert. Courtesy of Atlas Obscura. The FTC and the courts acted quickly to stop the predatory practices of one individual and two purported companies that engaged in unethical practices in the scientific fields. The court issued a summary judgement against Srinubabu Gedela and the two companies he owns (one publishes material in scientific-themed journals and one presents conferences.) The FTC provided evidence that, although the journal claims to peer-review articles it does not, and that is has used the names and logos of other agencies without permission. The fine is for $50 million. Amazing Stories has been back in existence for one year. To celebrate and launch a second year, they have a crowdfunding initiative for a four-color, special edition available in the fall. Would they be the Hugos, really, without a controversy? This year’s seems to be a pretty small one. The website An Archive of One’s Own, devoted to fan fiction, is a finalist in the Best Related Work category, and some people dispute that. Specifically, they seem to dispute the website’s place in that particular category. Steve Davidson over at Amazing Stories wonders why it wasn’t nominated in the Best Fanzine category. Locus Magazine provided a summary of FogCon 9. There’s a nice photo of Laura Blackwell in it. I think I might have linked to Laura’s Pushcart-Prize-nominated short story “An Accidental Coven” in Syntax and Salt before, but, if so, here is the link again. Syfy Fangrrls take a look at well-dressed deities in TV and movies. Marvel’s Loki is not included. He was robbed! IO9 likes where the second season of Freeform’s Cloak and Dagger is going. Graffiti on a traincar, image by Atlas Obscura. No reason, it’s just interesting: In Britain, they’ve rebuilt Heath Robinson’s code-breaking machine from WWII. Robinson was to the Brits what Rube Goldberg was to the USA. It looks like Robinson’s machine really did decrypt. I Like Scary Movies is a pop-up art installation that celebrates a number of current popular horror movies. This article postulates that primordial black holes cannot be the source of dark matter in the universe. It’s pretty interesting, and certainly written so a layperson can understand it. The article about “lensing” is fascinating too. 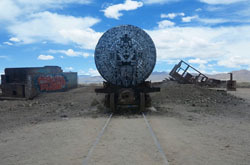 In the Andean desert is a locomotive and train graveyard. Images in today’s post came from this article.